An Administrative Representative performs a variety of clerical and administrative tasks. Typical duties listed in the Administrative Representative Resume include – answering and directing calls, organizing and scheduling appointments, planning meetings, writing and distributing correspondences, assisting in report preparation, developing and maintaining filing system, ordering office supplies, maintaining contact lists, booking travel arrangements, preparing and modifying documents, managing calendar, performing data entry tasks and making calls to internal and external sources. Administrative representatives are required to depict certain skills sets such as – knowledge of office management systems, working knowledge of office equipment, proficiency in MS Office, time management skills, work prioritization, multitasking skills, good researching and communication skills. While a high school diploma is considered mandatory, many employers prefer to see an education equivalent to a degree to the least. Summary : Detail-oriented Administrative Representative IV with 28 years of experience is seeking an accounting position which will allow utilization of developed analytical and problem-solving skills as well as thorough understanding of accounting software. Maintaining the weekly payroll, providing and administering Human Resource support for 100 employees at National Car Rental for both Charleston, SC and Myrtle Beach, SC locations through the use of the Kronos & Workbrain timekeeper systems. Establishing and maintaining files for tracking vacation/sick time and weekly time cards. Creating, illustrating and executing the employment advertisements for all locations. Recruiting, screening, and interviewing the prospective applicants for various positions. Distributing the new employee orientation materials and assisting with the completion of required paperwork. Maintaining and securing vehicle property taxes, license, registrations, and titles. Ensuring assets (vehicles) properly accounted for and managed [i.e. Unaccounted vehicles, overdue units, impound recovery as outlined by company policies]. Ensuring city expenses are approved, reconciled, and processed in a timely manner. 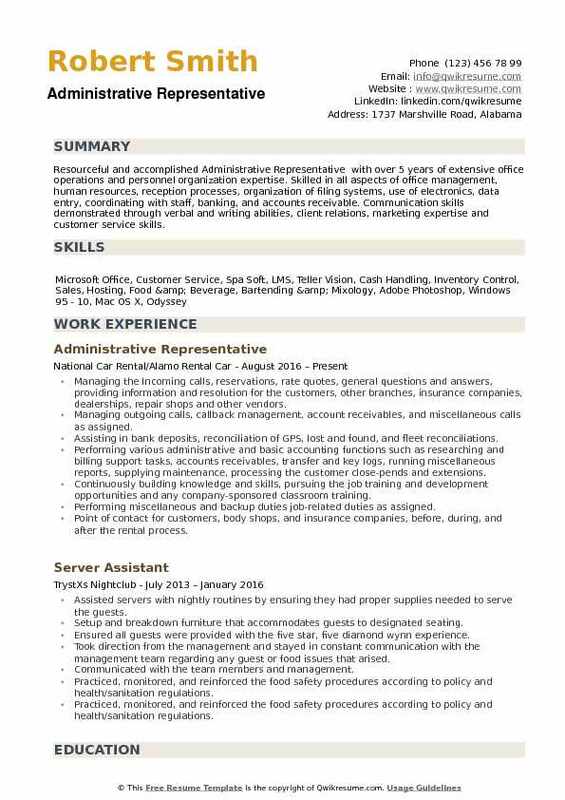 Summary : Administrative Representative with 14 years of experience is seeking to obtain a management position which allows me to express my professionalism and talents as a manager, team-player, and problem-solver. Monitored quality control and provided feedback to the management on issues related to the accounts that were out of balance. Billed claims for inpatients and outpatients to the insurance company on a UB04 or HCFA forms. Directed the workflow of 4 national clients and prepared the client analysis reports. Resolved escalated calls from patients and made corrections to accounts accordingly. Set up financial arrangements and negotiated collection of patient accounts. Reviewed exception report for administration errors, made collection calls and generated letters to patients with outstanding balances. Verified that NCOs FACs system was reconciled to the clients system utilizing reports and various computer systems in order to provide feedback to the client and management. Verified EOB to make sure the patient was billed the correct CO-pay/CO-insurance. Objective : Driven, hardworking and self-directed professional with extensive, exceptional Administrative Assistant experience of two plus years in a professional environment. Background includes management and staff support, sales-team support, cash handling and bookkeeping, inventory, scheduling and creation of memos and documentation. Providing administrative and office support activities for multiple supervisors. Performing receptionist tasks such as fielding telephone calls, receiving and directing visitors. Interviewing incoming patients prior to admission to gather demographic, insurance and emergency information. Explaining the facility policies, preparing and distributing patient identification bands, and arranging for transportation to assigned rooms. Performing additional duties including collecting copayments, answering phones, assisting family members, and conducting research for prior medical records and account folders. Maintaining solid customer relationships by handling questions and concerns with speed and professionalism. Resolving customer complaints, managing database records, drafting status reports on customer service issues. Handling all media and public relations inquiries (ex: advertising, open houses, events). 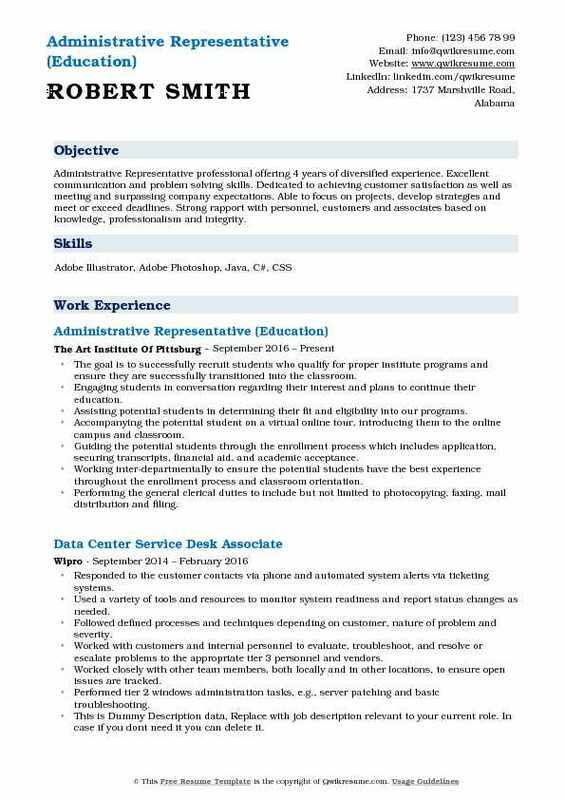 Summary : Meticulous Administrative Representative, excellent at juggling multiple tasks and working under pressure. Broad industry experience in Administrative, Labor and Entertainment. 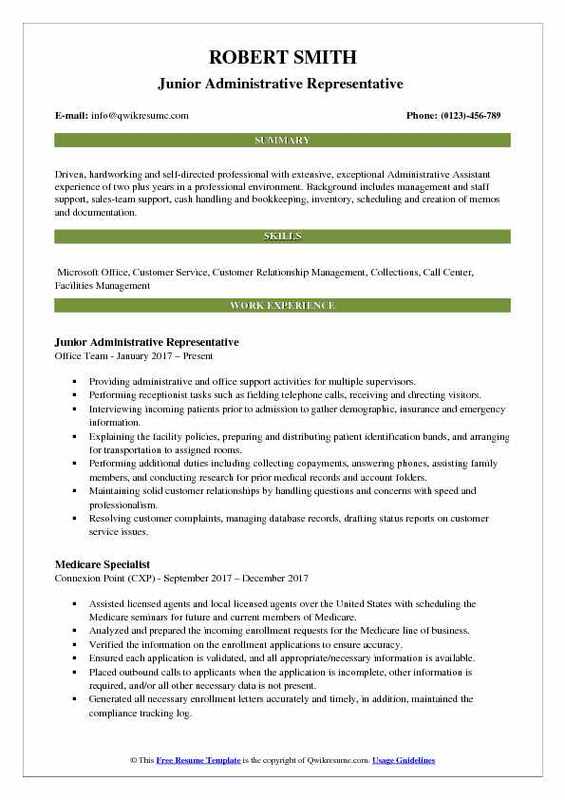 Skills : MS Excel, Word, Outlook, PowerPoint And Access, CRM, Bilingual And Biliterate (English And Spanish) ability To Multitask And Adapt Quickly. Prepare and analyze daily excel reports, including detailed daily and monthly sales reports and call logs. Transfer of patients medical records from hard copy to electronic database. Assist and guide patients through various applications and documents processes. Contact patients though various means in order to inform them of various products the company has available to meet their healthcare needs. Data entry of customers information for billing, insurance verification, and contact purposes. Conduct customer mailings using mail merge and other research methods in order to obtain accurate address. Prepares and sends hourly, daily and monthly reports to upper management. 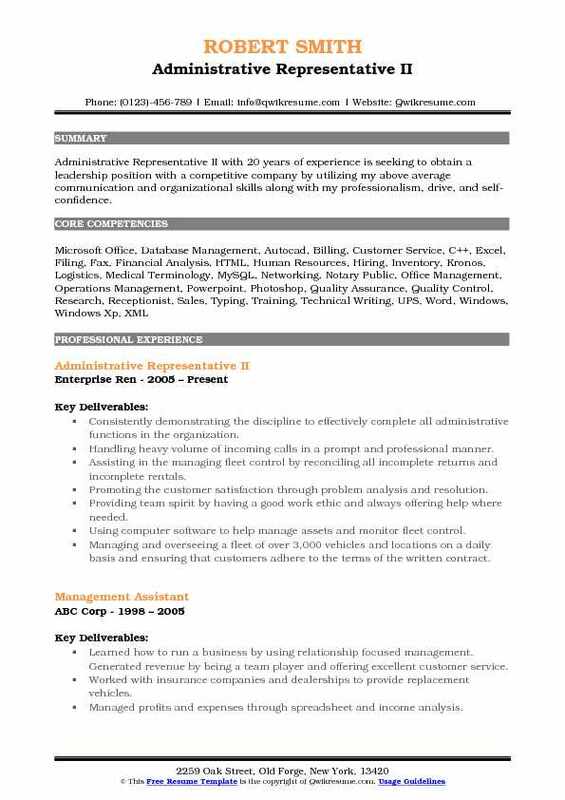 Headline : Administrative Representative with 7 years of experience in the social service domain is seeking for a position with growth potential where my discipline, positive attitude, professionalism, untiring efforts and interest can be utilized. Excellent skill sets in calendar & project management, annual meeting coordination and superior computer skills. Providing written or telephone response in a courteous and timely manner. Understanding the verbal and written instructions to perform the task assigned. Sorting the incoming mail for distribution and dispatch of the outgoing mail. Identifying the client primary needs and making appropriate referrals to community resources and/or public services. Explaining programs to each client, emphasizing the laws, regulations, rights, and responsibilities. Recording the clients statements and responses for case files on all points of eligibility. Completing all forms and documentation in accordance with county, state and federal policies. Handling all correspondence to the office, by responding or referring to the other department. Ensuring the timely and successful delivery of solutions according to client needs and objectives. 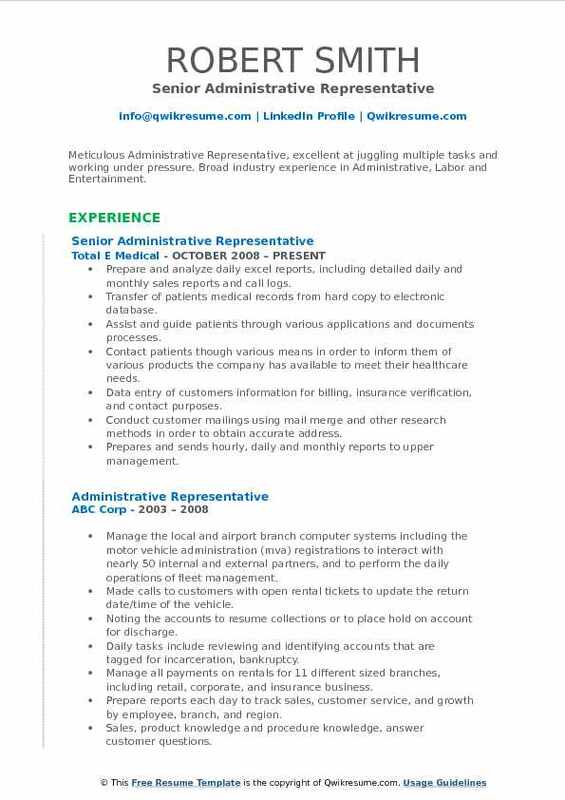 Objective : Administrative Representative professional offering 4 years of diversified experience. Excellent communication and problem solving skills. Dedicated to achieving customer satisfaction as well as meeting and surpassing company expectations. Able to focus on projects, develop strategies and meet or exceed deadlines. Strong rapport with personnel, customers and associates based on knowledge, professionalism and integrity. The goal is to successfully recruit students who qualify for proper institute programs and ensure they are successfully transitioned into the classroom. Engaging students in conversation regarding their interest and plans to continue their education. Assisting potential students in determining their fit and eligibility into our programs. Accompanying the potential student on a virtual online tour, introducing them to the online campus and classroom. Guiding the potential students through the enrollment process which includes application, securing transcripts, financial aid, and academic acceptance. Working inter-departmentally to ensure the potential students have the best experience throughout the enrollment process and classroom orientation. Performing the general clerical duties to include but not limited to photocopying, faxing, mail distribution and filing. Coordinating and maintaining the records for staff office space, phones, company credit cards and office keys. Creating and modifies various documents using Microsoft office. 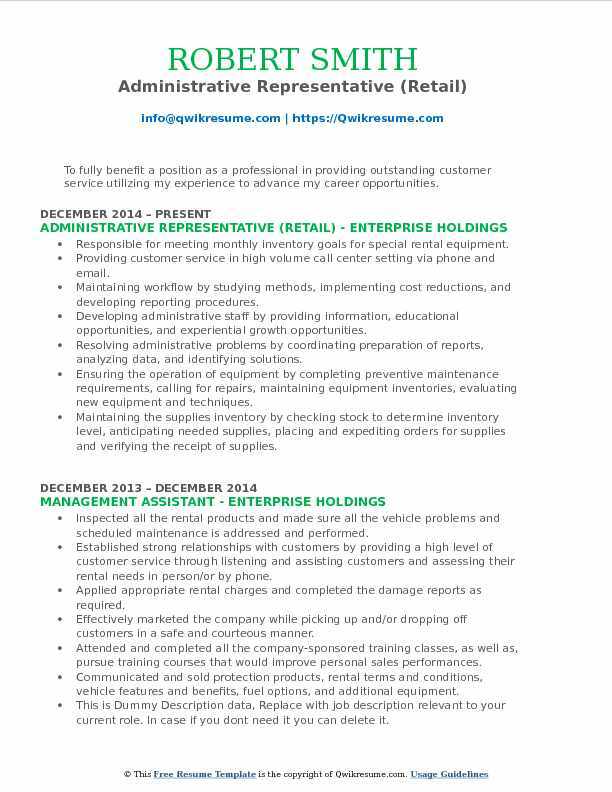 Objective : To fully benefit a position as a professional in providing outstanding customer service utilizing my experience to advance my career opportunities. Responsible for meeting monthly inventory goals for special rental equipment. Providing customer service in high volume call center setting via phone and email. Maintaining workflow by studying methods, implementing cost reductions, and developing reporting procedures. Developing administrative staff by providing information, educational opportunities, and experiential growth opportunities. Resolving administrative problems by coordinating preparation of reports, analyzing data, and identifying solutions. Ensuring the operation of equipment by completing preventive maintenance requirements, calling for repairs, maintaining equipment inventories, evaluating new equipment and techniques. Maintaining the supplies inventory by checking stock to determine inventory level, anticipating needed supplies, placing and expediting orders for supplies and verifying the receipt of supplies. 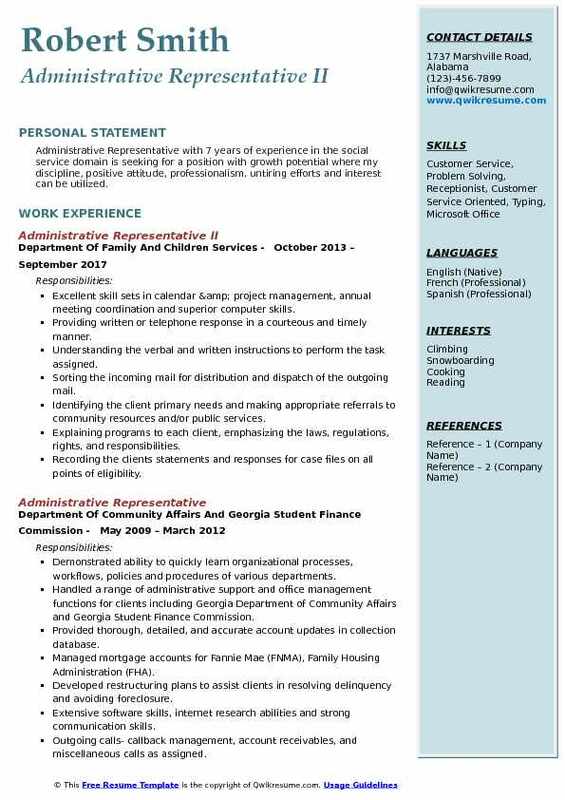 Summary : Administrative Representative II with 20 years of experience is seeking to obtain a leadership position with a competitive company by utilizing my above average communication and organizational skills along with my professionalism, drive, and self-confidence. Consistently demonstrating the discipline to effectively complete all administrative functions in the organization. Handling heavy volume of incoming calls in a prompt and professional manner. Assisting in the managing fleet control by reconciling all incomplete returns and incomplete rentals. Promoting the customer satisfaction through problem analysis and resolution. Providing team spirit by having a good work ethic and always offering help where needed. Using computer software to help manage assets and monitor fleet control. Managing and overseeing a fleet of over 3,000 vehicles and locations on a daily basis and ensuring that customers adhere to the terms of the written contract. Tracking the inspection records for the entire fleet and processing the vehicles for scheduled maintenance. 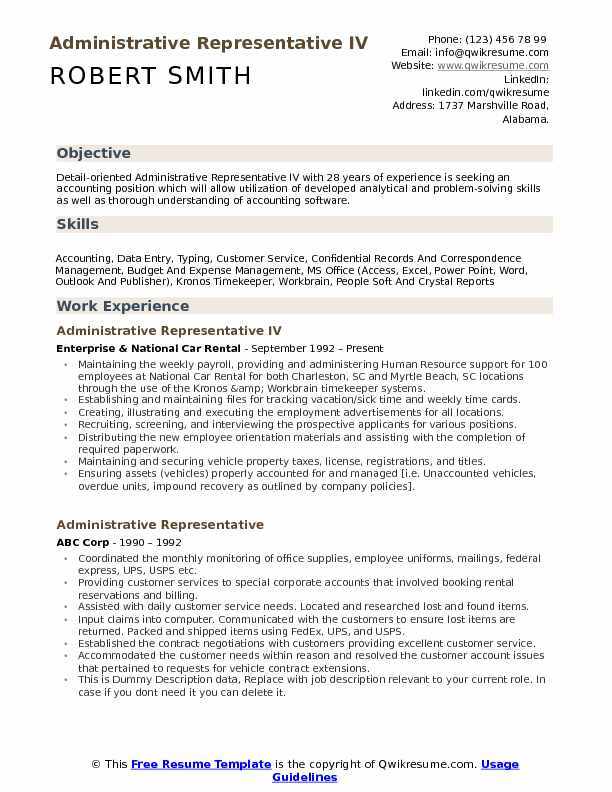 Objective : Experienced Administrative Assistant with strong organizational skills and valuable team player. Adept at multi-tasking while using independent judgment, initiative, excellent problem solving skills, and tact. Works well with little to no supervision and communicates to all levels of management. Works well in fast paced environment. Maintained the injury claims, including coordination between multiple non-standard payers. Reviewed the provider accounts to determine third-party involvement, including the review of medical records, ICD-9, CPT and Diagnosis Codes. Handled the patient information including, attorney, health, billing, accident reports and patient questionnaires also all correspondence for company and provider. Established and maintained a professional relationship with the provider and worked closely with Medicare team to ensure compliance and accurate billing to ensure timely resolution of accounts. Performed insurance research including obtaining police reports and NC lien follow up returns of all accounts for database and provider system, also returns for timely filing with health insurance. Collected, organized and analyzed the data for evaluations and completed the claim process. Oversaw the receptionist area, including greeted patients and responded to the telephone and in-person. 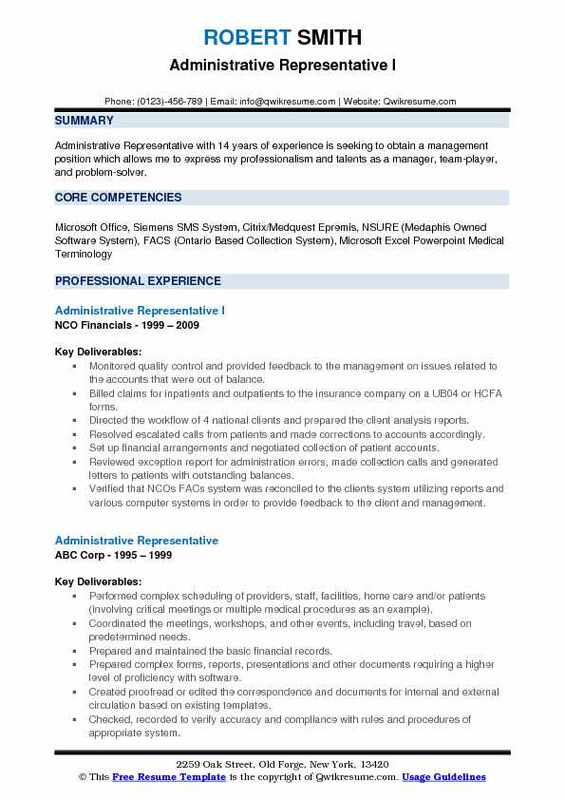 Objective : Resourceful and accomplished Administrative Representative with over 5 years of extensive office operations and personnel organization expertise. 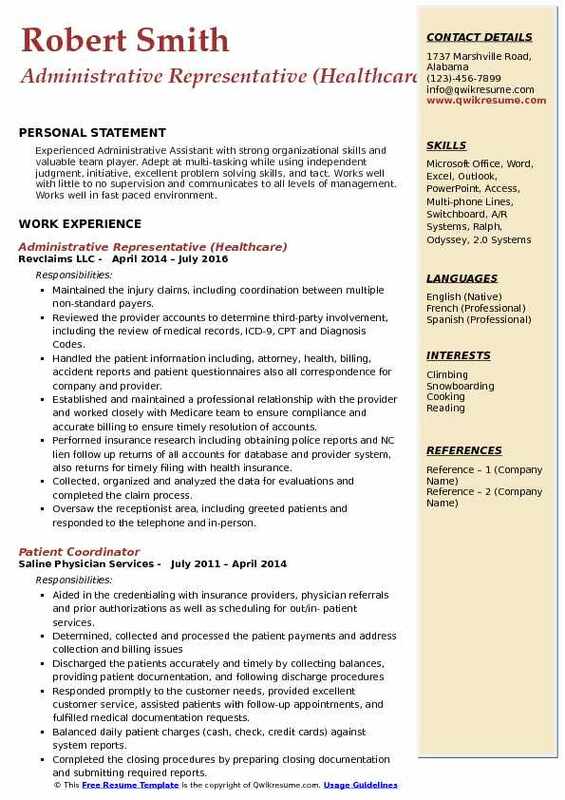 Skilled in all aspects of office management, human resources, reception processes, organization of filing systems, use of electronics, data entry, coordinating with staff, banking, and accounts receivable. Communication skills demonstrated through verbal and writing abilities, client relations, marketing expertise and customer service skills. Managing the Incoming calls, reservations, rate quotes, general questions and answers, providing information and resolution for the customers, other branches, insurance companies, dealerships, repair shops and other vendors. Managing outgoing calls, callback management, account receivables, and miscellaneous calls as assigned. Assisting in bank deposits, reconciliation of GPS, lost and found, and fleet reconciliations. Performing various administrative and basic accounting functions such as researching and billing support tasks, accounts receivables, transfer and key logs, running miscellaneous reports, supplying maintenance, processing the customer close-pends and extensions. Continuously building knowledge and skills, pursuing the job training and development opportunities and any company-sponsored classroom training. Performing miscellaneous and backup duties job-related duties as assigned. Point of contact for customers, body shops, and insurance companies, before, during, and after the rental process.